Decorating icing doesn't differ much from regular canned frosting: Both are easily adapted to intricate detail work or sturdy, upright designs, and both require coloring. Canned frosting has more stability and a longer shelf life than buttercream and royal icing -- your decorations won't droop or weep, and you can use leftovers for up to three weeks. Start with a pure white frosting (for colored icing) or chocolate frosting (for dark brown or black frosting) as the decorating icing base. 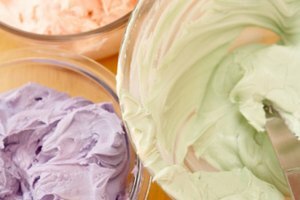 Adjusting frosting to the consistency needed for the type of decorating you intend to do is integral to the design, and it relies on your judgment -- there isn't a set formula to follow, but there are guidelines to get you on the right track. The icing's color is your call -- add concentrated icing color drop by drop until it reaches the desired final color. Regular food coloring thins the icing, but concentrated coloring causes to discernible change in consistency or taste. Add the white frosting to the mixing bowl or stand mixer. Whip the frosting for 30 seconds on low speed. Add the secondary ingredients -- corn syrup, milk, water or confectioners sugar -- and set the mixer speed to high. Test the consistency as needed. Dip a toothpick into the color after the icing reaches the desired consistency. Swirl the color into the icing until evenly dispersed. Repeat as needed. 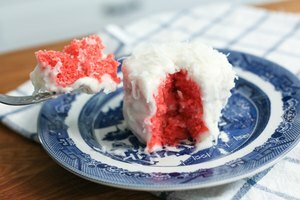 Store the frosting 2 to 3 weeks at room temperature in an airtight container.